Ahhh, the tromp, tromp, tromp of the marching boots of progress! And no, i’m not talking about Facebook’s new Master Plan to take over more of your life if you’re so foolish as to use their luscious new apps like Messenger that let you Stay Connected effortlessly with your hundreds of Friends®. Naw, i’m not real worried about that because 1) all the information i gave Facebook in my Profile, except for my name and city, is false and 2) all Facebook wants to do is sell me to the highest bidder. As opposed to the NSA which, when it discovers that i’ve ordered pizza from the same restaurant used by a terrorist suspect, will find that suspicious enough to turn me over to the CIA to be whisked away in the middle of the night and thrown into a secret prison without charges while they use enhanced interrogation techniques until i confess to committing whatever crime they want me to confess to. No need to soften me up, guys. Just tell me what i’m supposed to confess to, and i’ll do it right now. But hey, i’m not real worried about that because one of the fabulous advantages of being old and sick is that i would die fairly rapidly under even moderately harsh conditions, especially if they weren’t smart enough to coordinate with my health care providers and include all the meds that are keeping me alive in the liquid food they squirt in tubes through my nose or elsewhere. Sure is nice to have so little to lose anymore. So no, the progress i’m talking about today is Histropedia. I mean, didn’t your heart just leap when you read about this thing? Now, just when we need it most, we can all easily create our own historical timelines in a glossy and eye-catching format. But why, you ask, is that worrying? Well, the operant words above are “easily create”. Certainly historians have always been able to leave out inconvenient facts, but this application makes it child’s play to assemble mendacious timelines so beautiful that hardly anyone will notice the critical omissions. The neo-Nazis can do timelines that leave out all that pesky Holocaust stuff. The Roman Catholic Church can do a revised church history that paints the church more brightly. What massacre of the Cathars? What inquisition? What blocking the distribution of condoms to third world poor as the AIDS epidemic raged? What clerical child abuse and coverup? Naw, not within the scope of this project. McCain can do a timeline of US military victories that leaves out Vietnam, ends our invasion of Iraq with George Bush’s “Mission Accomplished” photo op three months after we hit the ground there, and focuses on our ongoing glorious victories in Iran, Venezuela, and France. Well, maybe not France, they having no oil. And meanwhile, i embark tomorrow morning on a Great Expedition Northward that will continue until i run out of steam and come slinking home. The Master Plan is to halt the adventure every afternoon with enough energy left to post a copiously illustrated travelog. Stay tuned. 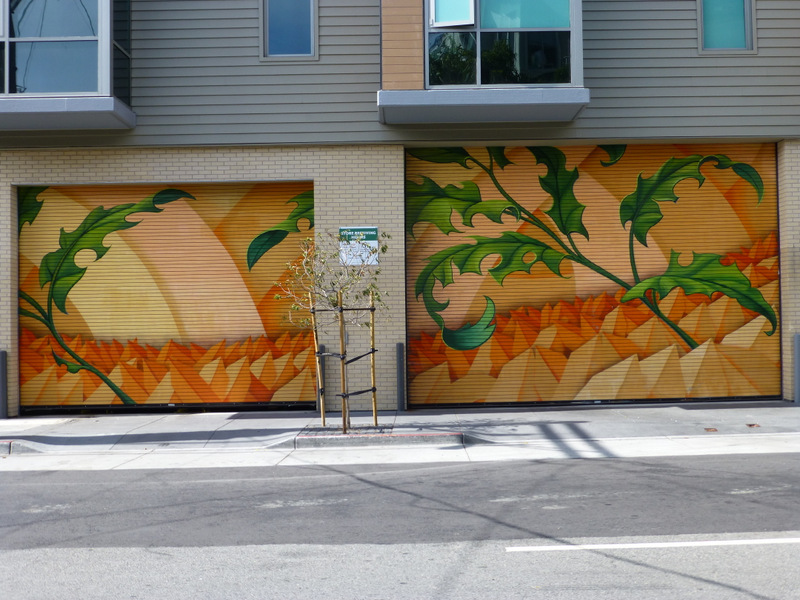 The Great Expedition will be focused on bridges, but since i have no photos of those yet, here’s a shot of one of Mona Caron’s newest San Francisco murals. It’s on 14th Street on the south side of that new building that stretches from the Whole Foods at the corner of Dolores and Market all the way down Dolores to 14th Street.